It’s precisely 10:20 A.M. Still in my bathrobe, I descend the aluminum ladder from the loft and emerge from the heated studio into the sharply frigid air of the Vermont winter. I get in the Jeep and turn the key. The engine coughs reluctantly, turns over, strains to a high-pitched idle. While it warms up I go inside the house to get dressed and wax my skis. My mind is elsewhere. I am distracted, an automaton, just present enough in the physical world to choose the right wax: Special Green, which according to the half-peeled label on the blunted crayon-like stub is for temperatures of negative ten to negative twenty degrees Celsius. It’s cold at the trailhead, maybe the coldest day of the year. A slight breeze causes the desiccated leaves still clinging to the beech saplings to tremble. The silence of the northern forest is profound, almost menacing; every so often it’s broken by the resounding crack of a freezing tree. But my skis caress the rolling terrain as I speed across it, kick and glide, the icy wind stinging my face. 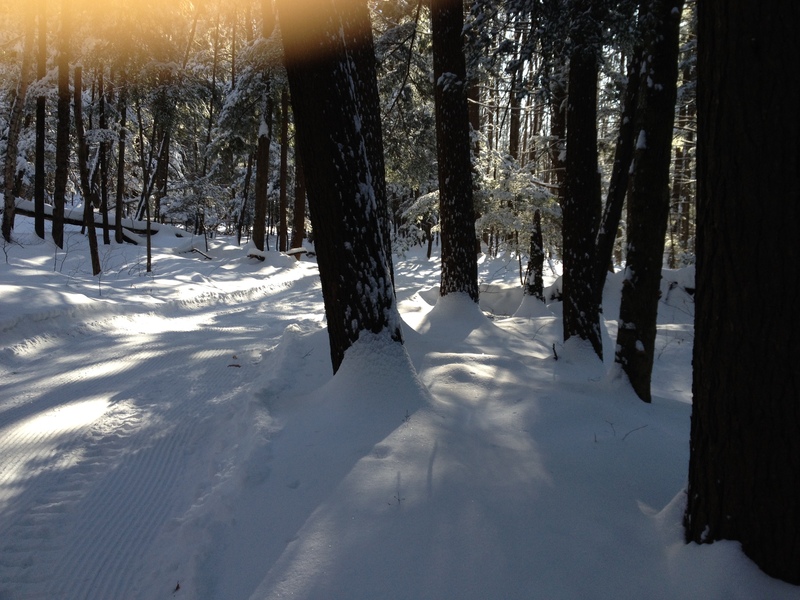 The only sound is the alternating hiss of my skis slicing over the trail, propelling me through the forest with an uncanny grace that belongs not to me, nor to any human notion of a superior position in the order of things, but to the confounding simple beauty of the wild. All winter I’ve been working on this novel. I don’t talk much about it, other than to acknowledge that the totality of the creative effort demands that I leave behind one workspace for another. Any art that traverses the dimension of time depends upon rhythm; in all seasons, for me, rhythm is inspiration. The great four-count rhythm of the yearly cycle; the everyday rhythms of waking and sleep, nourishment and exercise, work and play; and the moment-to-moment rhythms that reside within the body: heartbeat, circulation, breath. Winter allows me to add to these rhythms the blissful daily ritual of skiing—the exhilaration of speed, cold wind on the face—and this combination frees my mind to wander unshackled. Golden-green sunlight filters through the hemlocks and glints on the snow like a superb, bodiless liquor. Three deer flee over a frozen lake, bounding high, white tails flaring in unison like brandished flags. A raven rides the air above my head, rising and falling on the breeze, its voice a soft tympanic cruk, cruk, like two hollow sticks tapped together. I coast to the end of the trail and bend down to take off my skis. My mind is already back in the studio, where the ghost-voices wait—with a renewed inclination to speak. This essay originally appeared in Rivendell.